What does the Celebrant do? As your Celebrant I ensure that all the legal paperwork is correct and submitted promptly. I work with you to create a ceremony that will leave you both with the happiest memories. It’s my role to ensure your marriage is legal. I am also often able to provide a wealth of information and suggestions related to the many aspects of a wedding. 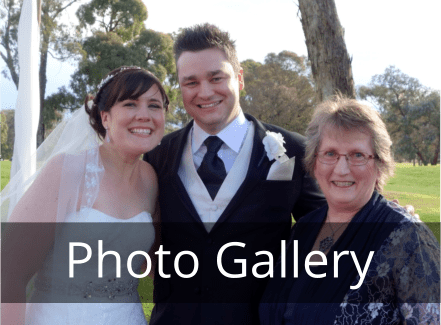 What does a Celebrant charge? There is no set or standard fee for a Celebrant. The average Celebrant charges are between $400 and $900 for ceremonies held in their area/region. See my Services page. Ensure you know what is included in your Celebrant’s fee. See my Services page. Consider all the elements of what the Celebrant includes / excludes for that fee. Do not choose a Celebrant on their fee alone! Meet the Celebrant and get to know them a little before deciding. How far in advance do we need to contact a Celebrant? You should call and make an appointment with me as soon as you have a date for your wedding. See my Contact page. You need to do this more than one month prior to your planned wedding date. Remember, as your Celebrant I may be able to assist you with much of the information you seek to prepare your wedding day. What are the legal requirements for marrying? You will be legally married under the authority of the Marriage Act 1961 and Marriage Regulations 1963. You must complete a Notice of Intended Marriage (NOIM) form which is valid for 18 months. You can obtain this form yourself from the Attorney General website. Click here to download form for your copy. This form must be given to me as your Celebrant at least one month prior to your wedding date. You must be over the age of 18 years. Special requirements apply for young people under the age of 18 years to be legally married (see the above website). Two witnesses to the marriage – both must be at least 18 yrs of age. Before your marriage you must both show me, your Celebrant your original birth certificate and/or your Australian passport. Non-Australian citizens must show their (translated) birth certificate or their current overseas passport. One other form of photo ID is also required. I then note details from these documents on the NOIM form. The couple must sign a legal declaration before the marriage stating that they are both legally able to marry each other. What must we provide to our Celebrant? Australian citizens must each present their original birth certificate and one other form of photo ID or their Australian passport. Non-Australian’s must present to the Celebrant their (translated) birth certificate and one other form of photo ID or their overseas passport. If you were previously married you must present to the Celebrant either your divorce notification, or the Death Certificate or your previous partner. All documents must be in English or be accompanied by an officially accredited English translation. The Celebrant booking fee. See my Services & Fees page. Do we have to attend any pre-marital courses? It is your choice to attend per-marriage courses. All Celebrants are bound to provide information to you on such courses and encourage you both to attend. 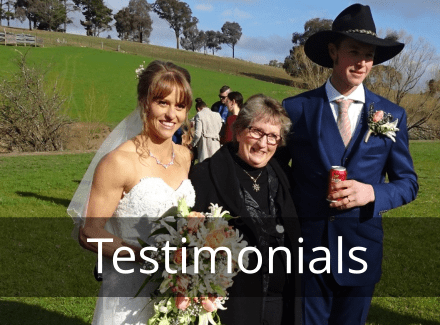 As your Celebrant I will give you a pamphlet titled “Happy Ever… Before and After” which contains information for couples planning to marry in Australia. Where can we be married? It is your choice where you hold your wedding ceremony. I have experience at conducting ceremonies at many local and regional wedding locations and venues. So if you’re unsure, let’s talk and let me help you make the perfect venue choice for your wedding ceremeony! Try to arrange a nearby indoor or sheltered venue as an alternative should the weather not be suitable for your outdoor venue on the day. Can I organise a ‘surprise wedding’ for my partner? It is a lovely romantic idea but you and your partner must both be aware of and consent to your impending marriage. This is a legal requirement. Are there any legal requirements for reaffirmation of marriage vows ceremonies? No. As this type of ceremony has no legal requirements you are free to make any type of arrangements. As your Celebrant I can help you plan for a most memorable and happy day. Will you travel to other locations outside the ACT to conduct a ceremony? Yes, I do travel to locations outside the ACT regional area. Please contact me to enquire about the particular place you have chosen for your wedding. Now we are engaged what do we do next? Congratulations on your engagement! 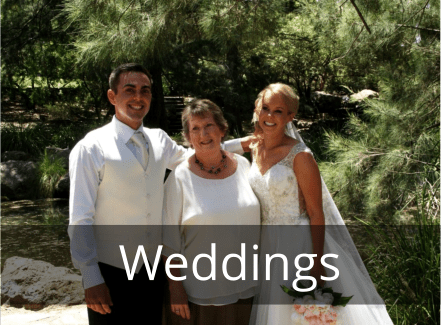 Once you’ve set your wedding date or have an idea when you would like to marry start looking for the right Celebrant to conduct your ceremony. You can get in touch with me anytime (see my CONTACT page) and I’m happy to meet with you to start a discussion about your wedding plans!